BCB Fishing Kit – As good as it gets! I reckon this is about as good as it gets for a lightweight hiking hand caster @ 10 grams (inc. line). It has a handy notch for holding the line from unravelling when not in use. 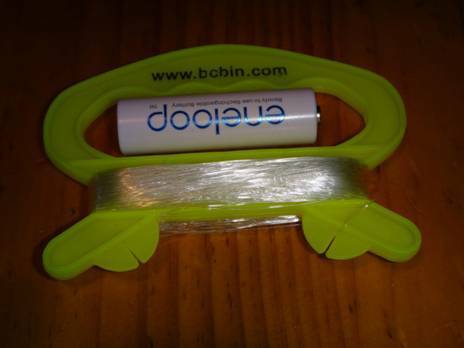 These BCB Fishing Kits are available from the UK for around $7 delivered if you buy half a dozen. Good stocking fillers! Once you have caught ONE 200 gram trout or blue cod you will think it was worth carrying one in your pack. The Eneloop AA battery is shown for contrast, but if you haven’t yet made the switch to these rechargeable batteries which retain almost full charge for over a year(! ), you should!